The Colchis is one of the species-rich refugia and a centre of biological diversity in western Eurasia. We analysed patterns of richness, endemism and invasions in relation to taxonomy (family membership), life form, certain habitats in the Colchis, and compared them to patterns found for Japan. We found that in the Colchis perennials are significantly over-represented in endemic species, and that they typically occur on limestone soils and in alpine tall herbaceous vegetation. The Asteraceae produce significantly large number of both endemic and alien species, whereas the Poaceae are over-represented in alien species but under-represented in endemics. Likewise, the Apiaceae are over-represented in endemics, whereas the Euphorbiaceae are over-represented in alien species. Similar patterns have been found in Yakushima, Japan. The Morisita-Horn index of similarity between these two sites was 0.83 (based on family size). Although the flora of Adjara comprised of fewer families than the flora of Yakushima, the largest families are richer in species in the flora of Adjara than in the flora of Yakushima. Floristic analysis of refugia of western Eurasia and their comparison with geographically distant areas can provide useful data for plant ecological and evolutionary studies. Potentially, such studies can produce testable hypotheses on plant migrations and on their historical geography. For example, the data presented in this study indicate that more severe conditions in the Pleistocene and geographical isolation of the Colchis may be responsible for the higher relative importance of adaptive radiation in the shaping of its modern flora. Refugia provide useful data for solving important problems of evolutionary biology, phylogeny and biological migrations. Modern distributions of relict species together with palaeo-ecological data depict an exciting picture of the history of nature. Comparative biological geographical studies of refugial areas such as Southeast Asia and southeastern North America created the modern classics of historical plant geography [1, 2]. The Colchis is a well-known refugium for many Tertiary relict plant species in western Eurasia. Due to its peculiar geography and natural history the Colchis is of particular interest for botanical and ecological studies. However, literature on the type of vegetation preserved here are scarce . The Colchis is primarily known for species-rich forests where rare woody species, which were widespread in the European Tertiary, are preserved [4–11]. Other components of Colchic vegetation are less studied. Here we undertake a more comprehensive approach to the Colchic flora by: (a) exploring the ecological potential of different taxa in the Colchis, and (b) comparing the structure of the flora within the key refugium in the Colchis (Adjara) with that of a key refugium in Japan (Yakushima), to see whether there are similarities in the response of different families to isolation into refugia. Specifically, we have compiled a list of plant species found in the Colchis, which provides data on biodiversity at different taxonomic levels, as well as information on life form, the status (endemic, naturalised), and habitat dependence of a species. The data obtained were analysed and a sample of Colchic vegetation (Adjara) was compared to a sample of vegetation of Japan (Yakushima Island). These two areas are geographically very distant, but exhibit similar mean annual temperatures and precipitation. Moreover, both Adjara and Yakushima are distinguished refugia with many endemic and relict species. Our work is largely explorative. 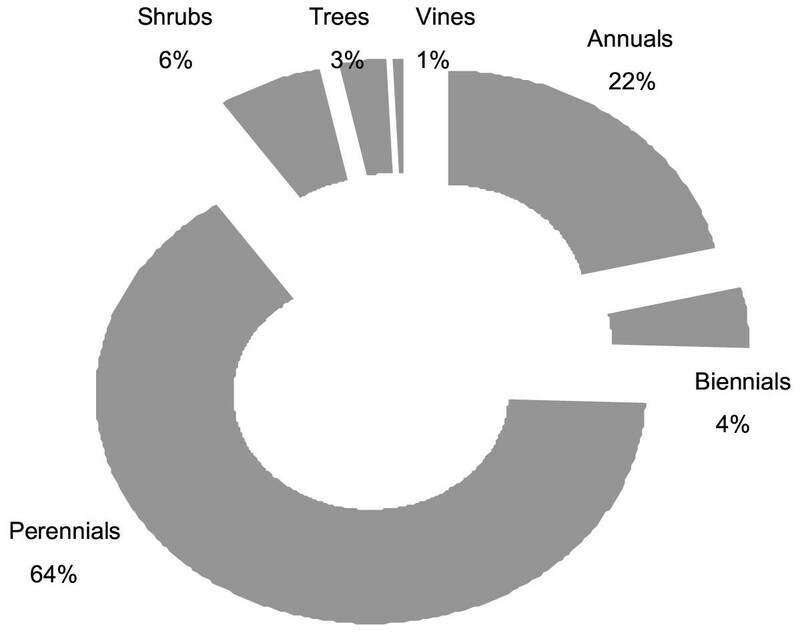 Specifically, we tried to clarify the following points: (a) number and size of families; (b) quantitative contribution of life form types – annuals, perennials, shrubs, trees, vines; (c) quantitative contribution of endemic, naturalised and other species; (d) deviations of proportions of endemic, naturalised and other species from the values found for the entire flora when analysed for different life form types (i.e., in which life form types are the most endemic or adventitious species expected? ); (e) distribution of endemic, naturalised and other species among vegetation types such as limestone habitats, tall herbaceous sub-alpine vegetation, wetland communities (i.e., which vegetation type favours most speciation (endemism) and which favours invasion? ); (f) distributions of endemic, naturalised and other species among families (i.e., which families have highest capabilities for adaptive radiation and which produce invaders? 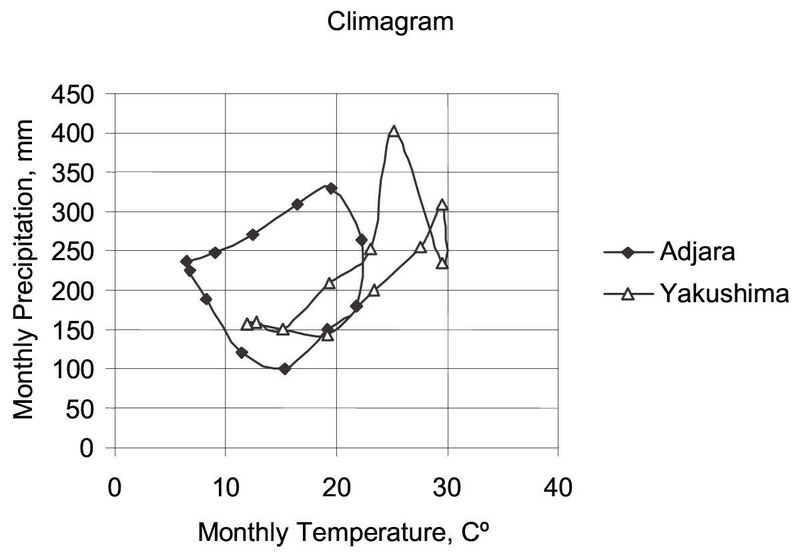 ); (g) distributions of taxa between the floras of Adjara (the Colchis) and Yakushima (Japan). We analysed the following plant categories: (1) endemic and (2) naturalised species - traditional targets in such analyses; we also added three categories related to habitats: (3) calciphiles – limestone habitats of the Colchis are species-rich and harbour many endemic and vicarious species; (4) tall herbaceous vegetation (hereafter altherbosa) – this generally rare type of vegetation is typical of the Colchis and yields many endemic and relict species; (in the Colchis altherbosa usually occurs at the timberline, but also on secondary sub-alpine meadows); (5) wetlands – this habitat is under special protection after Georgia joined the Ramsar Convention. We did not perform a special analysis for forest habitats, since Colchic forests are better studied, and since the role of forests in maintaining biodiversity is well established. Table 1 shows a list of angiosperm and gymnosperm families and their size (number of species) in the flora of the Colchis. Species are distributed among 769 genera and 139 families. Families differ strongly in size. The Asteraceae is the largest family with more than 300 species. Next is the Poaceae with more than 200 species, followed by the Fabaceae, Apiaceae, Brassicaceae, Rosaceae, Lamiaceae, Caryophyllaceae, Cyperaceae, and Scrophulariaceae, each with more than 100 species. On the other hand, 73 families have less than 5 species. The value of λ (used to characterise taxonomic diversity by family size, (see Materials and Methods) was 0.045, pointing to the concentration of species in larger families. The same value would be obtained if there were only 22 families but of equal size. Hence, the probability that two randomly selected species will belong to the same family is 5.77 times higher in the real list than it would be if families were distributed uniformly. Difference between observed and expected percent share of endemics and naturalised species within the life forms. p-values are from randomisation test, which poses a null hypothesis that endemics and naturalised species occur in the same frequency as the other species across the different categories. a) Fewer annuals than expected in the endemic, limestone, altherbosa and wetland species groups, whereas they are far over-represented in naturalised species. 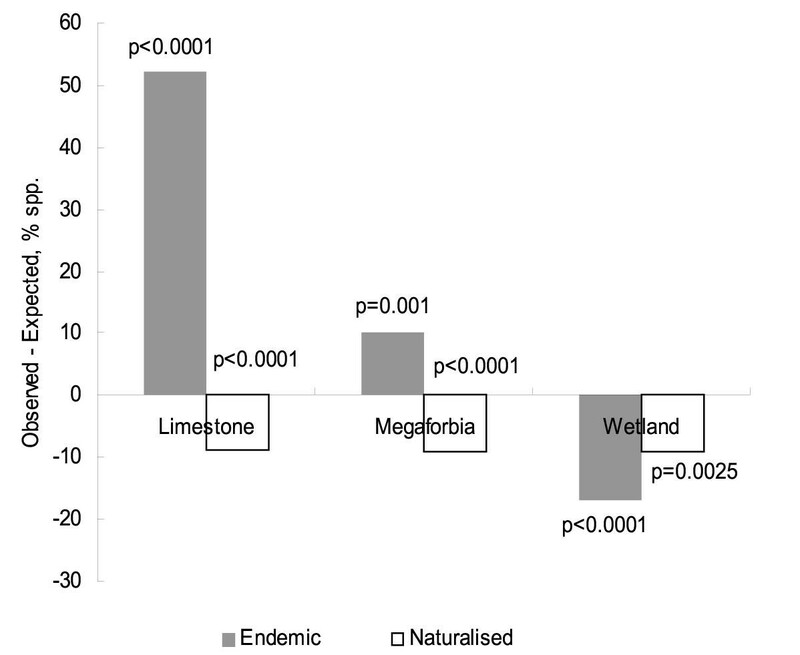 b) Fewer biennials than expected in limestone, altherbosa and wetland habitat groups. c) More perennials than expected in the endemic, limestone, altherbosa and wetland species groups, but fewer in the naturalised species group. d) Fewer shrubs than expected in the altherbosa and wetland species groups. 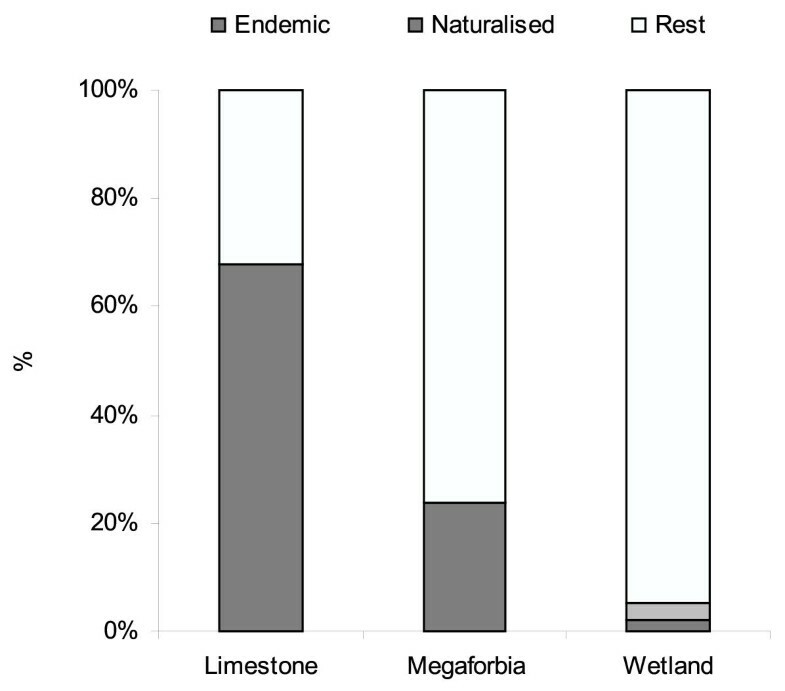 e) More trees than expected in the naturalised and limestone species groups but fewer than expected in wetlands. f) More vines than expected in naturalised plants. Almost 70% of limestone species are endemic (Figs. 3 and 4). Altherbosa also contains a high number of endemic species, whereas endemics are rare in wetlands. The number of naturalised species is lower than expected in all habitat categories (altherbosa is completely free of aliens – Fig. 4). Percent share of endemics and naturalised species within the analysed three habitat types. Difference between the observed and expected percent share of endemics and naturalised species within the analysed three habitats. p-values are from randomisation test, which poses a null hypothesis that endemics and naturalised species occur in the same frequency as the other species across the different categories. It may be assumed that taxa differ in their potentials for adaptive radiation and migration. This can bias the taxonomic structure of the analysed plant categories. We examined the proportions of the 42 largest families (with more than 10 species – Table 2) in the 5 different plant categories. Twenty-three families demonstrate significant positive or negative deviation from the expected values. There are no Cyperaceae in altherbosa, whereas in wetlands this family is represented by far more species than expected. The Juncaceae repeat the pattern of the Cyperaceae. The Campanulaceae appear to be biased especially towards limestone, producing a vast number of endemic species on those soils. In the Ranunculaceae, the subfamily Helleboroides appears to be extremely biased towards altherbosa. Among the larger families the Apiaceae contribute many of the species growing in altherbosa and include a considerable number of endemics. The Poaceae show a very different bias, being surprisingly under-represented in altherbosa and wetlands but over-represented in naturalised species; at the same time the Poaceae contain far fewer endemic species than expected. The Asteraceae resemble the Apiaceae in having many species typical of altherbosa and having more than the expected number of endemic species. Simultaneously, they are under-represented in wetlands yet over-represented in naturalised species. The Fabaceae are remarkably under-represented in wetlands and in endemic species. The Caryophyllaceae and the Rosaceae are also under-represented in wetlands, as well as in naturalised species. The only bias with the Lamiaceae is its under-representation in altherbosa. Taxonomical biases across the analysed plant categories in the Colchis expressed as significant difference between the observed and expected family sizes in these categories. Significance is tested by a randomisation test (p < 0.05), which poses a null hypothesis that species occur in the same frequency across the different categories. So far, all these calculations have been performed with angiosperm and gymnosperm species. Ferns are fewer in number (less than 3% of the total list), and their life form diversity is low. Ferns contain 4 endemic and 4 naturalised species, and these numbers do not differ from the expected proportions significantly, as tested by the randomisation test. The concentration of species in the larger families for Adjara followed the same patterns as found in the entire Colchis (λ = 0.045, see above), whereas for Yakushima the concentration was lower (λ = 0.035). 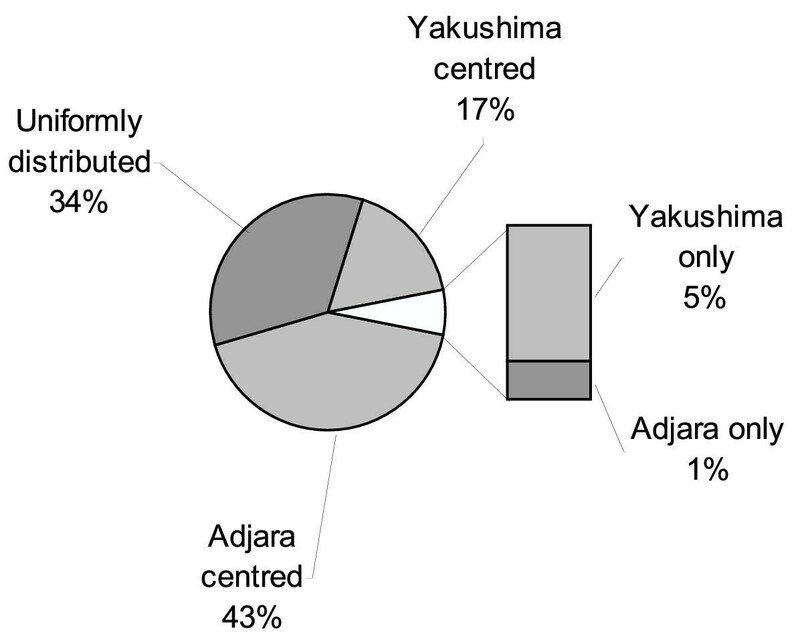 Presence/absence data from both floras show that Yakushima and Adjara have 54% of families in common, 36% are present only in Yakushima and 10% only in Adjara. However, consideration of family size shows that in fact the flora of these two sites are more similar than this data suggests – the Morisita-Horn index based on family size is as high as 0.83. Indeed, families not shared between the two sample areas are small and comprise only 6% of the species (Fig. 6). Accordingly, distributions of these small families are narrow. Family distribution between Adjara and Yakushima. The filled areas of the bar shows total frequencies (number of species) of families that are found only in one of the locations; the filled areas of the pie represent total frequencies of families that show certain patterns of distribution as distinguished by randomisation test. For the families common to both sample areas we used randomisation to test the null hypothesis that families are distributed at the same frequency in both locations (Figs. 6 and 7). 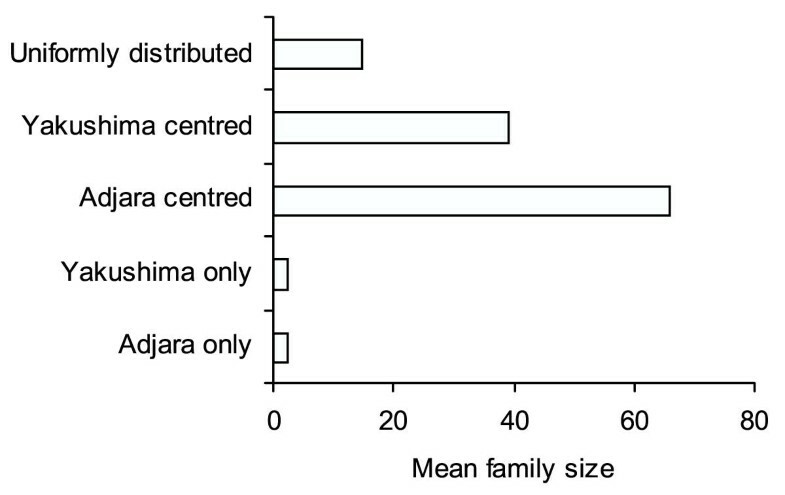 Apparently, fewer families are centred towards Adjara (have more species in Adjara than expected under the null hypothesis, which assumes a uniform distribution of families), but these families tend to be relatively large, whereas there are more numerous but comparatively smaller families centred towards Yakushima. Mean size of families (in number of species) distributed between Adjara and Yakushima. (a) Larger families that contain in particular many weeds (Poaceae, Polygonaceae, Solanaceae, Euphorbiaceae, Primulaceae). (b) Smaller families of invasive species and weeds (Amaranthaceae, Amaryllidaceae, Apocynaceae, Aristolochiaceae, Capparidaceae, Commelinaceae, Convolvulaceae, Dioscoreaceae, Iridaceae, Loranthaceae, Oxalidaceae, Phytolaccaceae, Plantaginaceae). One hundred and six species occur in both sites (see Additional File 2). Out of them 98 are listed in the "Geographical Atlas of the World Weeds" . The rest also range widely, among them plants of aquatic, coastal, wet and moist habitats (Calystegia soldanella, Drosera rotundifolia, Microstegium japonicum, Myosoton aquaticum, Paris quadrifolia, Parnassia palustris, Zostera marina), and economically or otherwise valuable species dispersed by human agency (Cardamine impatiens, Rhus javanica, Vitex rotundifolia). An interesting component of similarity is the woody genera of wide distribution (Acer, AInus, Berberis, Buxus, Carpinus, Castanea, Celtis, Clematis, Daphne, Diospyros, Euonymus, Fraxinus, Hedera, Ilex, Ligustrum, Lonicera, Osmanthus, Paliurus, Prunus, Quercus, Rhamnus, Rhododendron, Rhus, Rosa, Rubus, Salix, Smilax, Sorbus, Swida, Tilia, Vaccinium, Viburnum, Vitex). Some of them have many endemics and show a remarkably disjunct distribution. We also compared the contribution of larger families to plant categories for these two sites (not shown). We found that the Asteraceae and Poaceae contained more naturalised species than expected at both sites although this was not significant for the Poaceae in Yakushima. Endemic Asteraceae are also significantly more frequent than expected in both Adjara and Yakushima, while those of Poaceae are significantly less frequent. Other large families also show certain structural patterns. For example, the Apiaceae contained significantly more endemics than expected at both sites, whilst the Euphorbiaceae have a significantly larger proportion of naturalised species than expected at both sites. Taking into account the small area and relatively high latitude of the Colchis, the richness of its vegetation seems very remarkable. However, richness alone does not completely describe the floral diversity. Unfortunately, data on species abundance are incomplete, thus calculations of diversity indices based on the abundance distribution are impossible. Instead, we analysed the taxonomic diversity and the distribution of families and genera in specific habitats and plant categories such as endemic or naturalised plants. Some of the distributional patterns of species categories among life forms are not surprising. For example, the abundance of annuals in the naturalised species category was predictable, since both invader and weedy species tend to be annuals, as are often used as crop species. Vines also appear to escape easily from cultivation. The abundance of perennials in altherbosa seems natural as well, since this type of vegetation is comprised of large forbs, which tend to be perennial species. 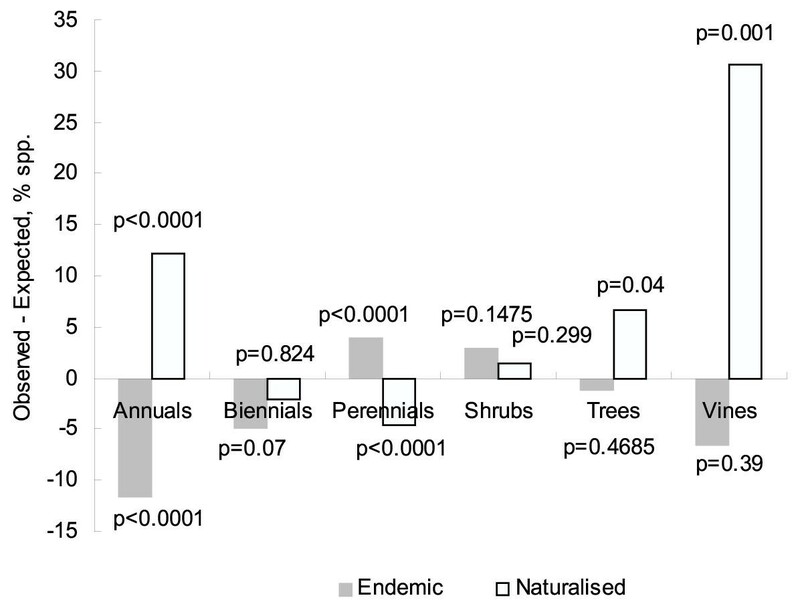 Perennials clearly predominate in the endemic species category. A remarkable pattern is the over-representation of trees and very high proportion of endemic perennials on limestone. Community types that are discontinuous, such as limestone habitats, probably favour speciation but may also provide ecological niches for tree species that are outcompeted by Fagus orientalis, Quercus spp., Abies nordmanniana, Pinus kochiana, Picea orientalis in climax forests. Altherbosa may also be considered quite a unique community type as it has many endemic species and a highly distinct taxonomic composition. The lower than expected proportion of endemics in the wetlands of the Colchis may suggest that these communities are similar to those outside of this region, yet even this small number of rare elements such as Kosteletzkya pentacarpos, Hibiscus ponticus, Rhamphicarpa fistulosum, Rhododendron luteum make them unique among the wetlands of western Eurasia. We compared the Colchis with an area in Southeast Asia, which is often included in biogeographical comparisons, especially with south-eastern North America [1, 2, 14–16]. Many taxa with disjunct area, especially relict woody plants, occur in these two geographical regions, indicating that a homogeneous forest vegetation covered large areas of the northern hemisphere during most of the Tertiary . During the Ice Ages these two regions served as refugia for plants. After the ice sheet retreated some taxa were able to migrate and re-colonise large areas forming the modern vegetation, whereas some species (relicts) still remain within the old refugial area. Some studies have compared Southeast Asian and North American refugia with similar areas in the Caucasus to show that relicts are preserved there too [6, 11]. The observed pattern in plant family distribution reflects the different history of climate in eastern and western Eurasia during the last geological epochs. Since climate change was more severe and drastic in western Eurasia [11, 17], re-colonisation was especially important for shaping the modern floras. Not all taxa were able to re-colonise, and the empty niches were filled by adaptive radiation of migrating taxa. Additionally, western Eurasia, and the Colchis in particular is poorly connected geographically to subtropical and tropical vegetation. Taxa that were extinct within the Colchis could not be replenished by immigrating tropical taxa as occurred in Southeast Asia ; this appears to have facilitated the adaptive radiation of locally surviving taxa. The result is that families are generally larger, but with fewer families in western than in eastern parts of the Eurasian continent. The comparative analysis shows that at the species level the similarity between Adjara and Yakushima is due to (a) widely distributed, predominantly naturalised annuals such as weeds and escapees, and (b) plants of aquatic, coastal, wetland and other water-related habitats. (The latter may explain why the wetland species in Colchis have significantly fewer endemic species than expected; apparently such a pattern is common elsewhere.) A remarkable component of similarity is tree genera of wide and often disjunct distribution. Finally, the high similarity at the family level seems to reflect merely that both sites belong to the same biogeographical region (Palearctis). The patterns of plant distribution among different categories combine the ecological and evolutionary aspects of taxonomy. For example, a high potential for adaptive radiation of the Apiaceae may be seen in the fact that this family produces significantly more endemic species, whereas the high migration potential of the Euphorbiaceae may account for the significantly larger proportion of this family in the naturalised species. Likewise, the Asteraceae seem to have a strong potential for both migrations and adaptive radiation, whereas the Poaceae are remarkable for a high migration potential but may have a low potential for adaptive radiation. The Apiaceae and, especially, the Asteraceae are also very specious taxa of high altitudes and latitudes. Apparently, they were able to diversify not only in the Post-glacial but also during the Pleistocene. Floristic analyses of refugia of western Eurasia and their comparison with geographically distant areas can provide useful data for plant ecological and evolutionary studies. Potentially, such studies can produce testable hypotheses on plant migrations and on their historical geography. For example, our results suggest that more severe conditions in the Pleistocene and geographical isolation of the Colchis may be responsible for the higher relative importance of adaptive radiation in the shaping of its modern flora. As a result, here the largest families are richer in species than in other refugia. The Colchis (Kolkheti, Colchida) has a number of different definitions. Usually, the Colchis is understood as the western part of Georgia (41° to 45°N, 40° to 46°E). This political and administrative perimeter of the Colchis concurs well with its natural borders, which slightly expand to Russia and Turkey (Fig. 8). However, in some early publications the Colchis has been defined as the lowland part of the Rioni valley only, or even as just a narrow stripe of coastal lowlands of Adjara and Guria between the estuaries of the rivers Tchorokhi and Rioni with an especially humid and warm-temperate climate . Geographical location of Colchis. 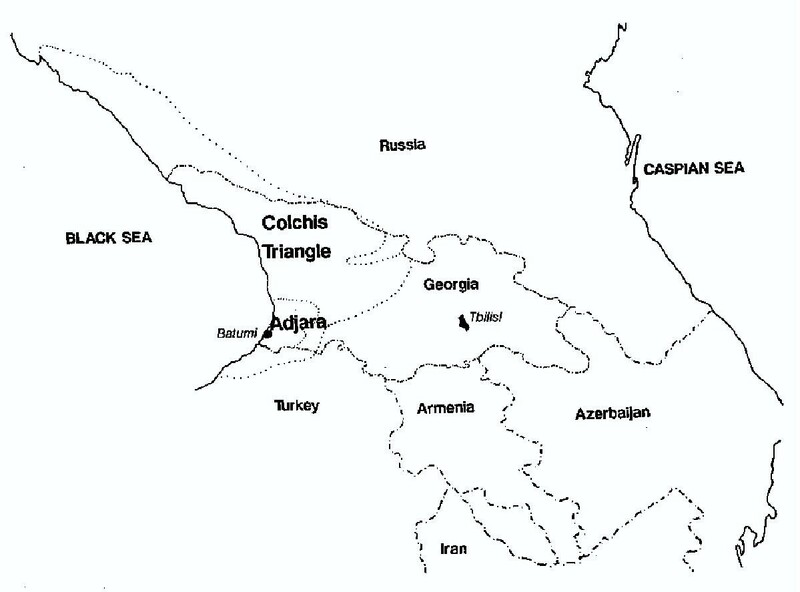 Concentric contours around Adjara indicates most humid and warm climate within the Colchis Triangle. To us the natural borders of the Colchis are set by the occurrence of a particularly humid and warm climate, with an annual precipitation no less than 1500 mm, mean annual temperature in the lowlands ca.13°C, and an altitudinal thermal gradient of ca. 0.5 C°/100 m . The botanical and geographical distinction of the Colchis corresponds well with these borders. Therefore, the Colchis comprises an area from the north-western part of the Caucasus (Tuapse) to the north-eastern part of Anatolia , forming the "Colchic Triangle". This area is sheltered by the ranges of the Great and Small Caucasus mountains to the North, East and South, whereas to the West it is open towards the Black Sea. The warmer and more humid climate, sharply distinguishing the Colchis from adjacent areas, is a consequence of this peculiar geomorphologic configuration. The geological characters of the Great and Small Caucasus differ. Jurassic slates and sandstone, Cretaceous limestone, marls, sandstone and Palaeozoic granites underlie the former, whereas the latter is founded on Eocene volcanic bed-rocks such as andesites, with Palaeocene and Lower Eocene clays, marls and sandstone. The soils are a mosaic of alluvial, yellow, red, rendzina, brown forest, mountain meadow and peat soils, and andosols. The dissected topography with numerous isolated gorges, the altitudinal range from sea level to snowline, and the mild climate – all contribute to the high richness of the Colchis flora. The most common types of natural vegetation of the Colchis are listed in Table 3. We prepared the list of the Colchic flora based primarily on the Key of Colchic Plants , on the Key of Adjara Plants , and on the published volumes  of the second edition of the Flora of Georgia. As a result, a number of taxonomic synonyms have been accumulated due to changes within and differences between the nomenclatures. A separate list of these synonyms is supplemented, while the main list includes the latest versions of the taxa names. We include 2903 vascular plant species with 77 fern, 10 gymnosperm and 2722 angiosperm plants. Due to discrepancies found in different sources, 94 angiosperm species are regarded as "questionable" and are listed separately. The information, provided by the main list of species, is the following. • Family, genus and species. • Life form (annual, biennial, perennial, shrub, tree, vine). • Species status (endemic, naturalised). • Other particulars (escapee, alien, weed, parasite). where: x i and y i are, respectively, the size (number of species) of ith family in the first and second sites, S x and S y are, respectively, total family size in the first and second sites; d x and d y are calculated, respectively, as d x = Σx i /S x and d y = Σy i /S y .
Randomisation was used to test the null hypothesis that species are distributed at the same frequency with respect to different plant categories (endemic, naturalised, family membership, life form, and habitat). Randomisation methods do not require any assumptions on data distribution but generate empirical distributions from the observed sample. This advantage is especially important with small samples common in ecological studies, and randomisation tests increasingly replace standard statistical tests in ecological research [25, 26]. First we calculated the observed proportions of life forms in different categories, next we generated the null reference distribution by rearranging the order of observed data over the categories by shuffling them randomly, and computed the proportions for data so randomised. We repeated randomisations 10000 times calculating the randomised proportions while the significance level was determined from the number of randomisation proportions equal to or more extreme than that observed. We are grateful to Rob Brooker, Ladislav Mucina, Nugzar Zazanashvili, David Kikodze and anonymous reviewers for their valuable comments on the manuscript.